We are proud to be working closely with Accessible Boating, a Charity providing opportunities for people with disabilities or those with access difficulties to go boating on the Basingstoke Canal from Colt Hill Wharf, Odiham in Hampshire. CALL US TO CHECK AVAILABILITY for Madam Butterfly ONLY. 2 accessible boats are available: DAWN, a day boat; and MADAM BUTTERFLY, a cruising boat. Both boats are specially designed and equipped to cater for those with disabilities or reduced mobility. Hydraulic lifts give easy access for those in wheelchairs and both boats have accessible toilets. Self-drive hirings are open to both novices and experienced boaters alike, because full tuition tailored to individual requirements is provided at the start of each cruise by trained Despatchers. 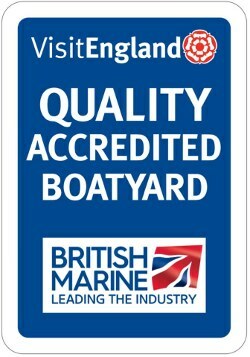 If you have any concerns about boat handling, please contact Accessible Boating, as they will provide whatever support you need. 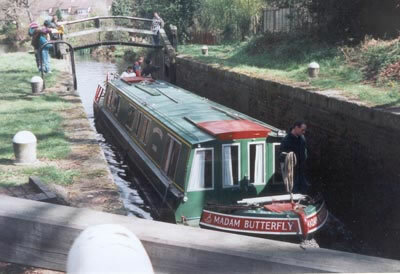 Madam Butterfly is a cruising boat equipped with a hospital bed and other facilities to allow able-bodied carers to accompany those with mobility problems. We accept bookings from 3 nights to 7 nights and have produced an itinerary guide to help you plan your trip. There is ample storage, a gas cooker, electric refrigerator, accessible shower and toilet, central heating and a dining area. Kitchen equipment, china, cutlery and glasses are provided, as is bed linen. Fuel is included in the price. Wheelchair access to the boat is via a dismountable gang plank onto the rear deck. The front and aft decks have safety rails and are large enough for a wheelchair when cruising. Hydraulic lifts fore and aft give ready access to the cabin and front deck for those in wheelchairs. There is a 12v charging point for a mobile phone and, ideally with the engine running, a 230v supply at up to 600 watts is available to charge wheelchair batteries, or electric hoist batteries or to run low-powered medical equipment. There is also a 2-pin razor socket in the shower room. TV and radio are fitted in the main cabin. Madam Butterfly offers sleeping accommodation for up to 7 people. When under way, there must always be 2 able-bodied people acting as crew in addition to carers. The maximum number on board at any time, including any visitors, must not exceed 12 (including any ABA personnel). Only registered assistance dogs are allowed on board. See full conditions of hire HERE. All Prices are in Pounds Sterling (£). If a price is marked as red, the holiday is not available. If you enquire about a holiday we will hold it for you for 24 hours. Dawn is a self-drive day boat certified for carriage of up to a maximum of 12 persons (including any ABA crew members). If you would like to book Dawn for day hire please contact ABA directly on 07934 926683. A powered wheelchair without occupant counts as the weight equivalent of one passenger, so when such a wheelchair is occupied, it counts as two. An occupied unpowered wheelchair counts as one. An electro-hydraulic lift allows wheelchairs to gain easy access to the spacious cabin and accessible toilet. A gas hob allows preparation of hot drinks. Cabin windows can be rolled up to give plenty of fresh air on warm days, or kept down to protect against the English weather. Central heating is also fitted. The aft deck is equipped with a safety rail and is large enough to accommodate a wheelchair when cruising. 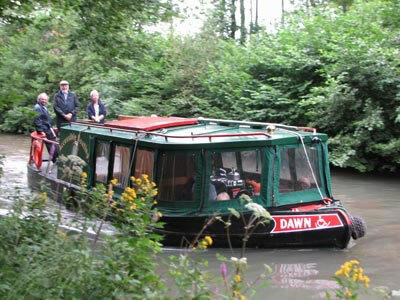 Because Dawn is relatively small, it can be turned round in many of the wider stretches of canal and does not need to find a Winding Hole like the larger boats.